This shortcode is used by the “Points for referrals” hook which allows your users to gain points for referring visitors and/or signups. This shortcode will return the unique referral ID of the user who views the shortcode. 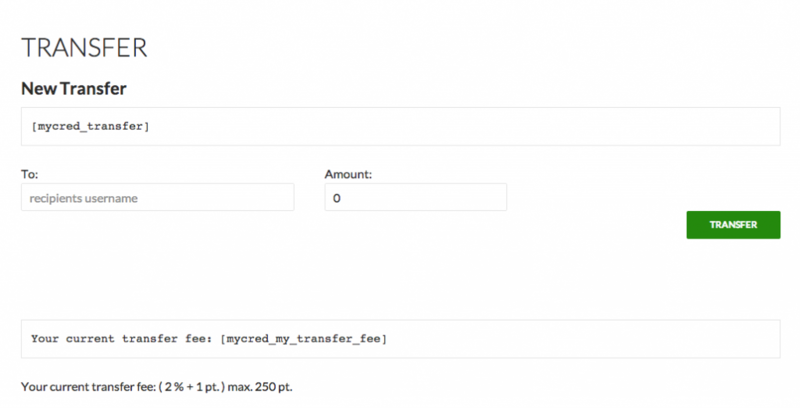 If the user is excluded from using myCRED or the particular point type or if the shortcode is viewed by a visitor this shortcode will return an empty string. Example 1: Insert a users referral ID into a sentence. This shortcode allows you to present the “best” user according to their total accumulated balance or by one or more references. The shortcode by default shows the users name and avatar but this can be customized to show the details you want. The shortcode will present by default the users avatar and display name, but this can be customized by wrapping the shortcode around custom HTML. See below for available template tags you can use. ref string No - Optional reference(s) to base the best user of. Can either be one particular reference or a comma separated list of references. from string No - Optional date from when log entries should be calculated. Can be either a well formatted date or keywords like "now" or "today". See strtotime for further information on available options. until string No - Used in combination with "from" the end date of calculations. Can be either a well formatted date or keywords like "now" or "today". See strtotime for further information on available options. types string No mycred_default Option to limit calculation to a particular point type or a comma separated list of point types. nothing string No "No user found" Text to show if no user was found to be the best based on your shortcode setup. order string No DESC The sort order to use in calculations. Can either be "DESC" for descending or "ASC" for ascending. avatar int No 50 The size of the avatar image without "px". %total_abs% – replaced with the total calculated points amount and converted it into a positive number. Use this if you add up negative values but want to show a positive value. Example 1: Show the best user based on who has received most points for approved comments. Example 2: Show the user who has gained most points from January 1st 2014 until now. Will calculate all instances no matter what point types there exist. Example 3: Show the user who has spent most points in the store. Note that purchases are stored as a negative value which means we need to reverse the order or the user who spent least will show up. Example 4: Show the user who has gained most points from the default point type and a custom point type. Example 5: Show the user who has gained most points no matter which point type is used, and adjust the template to only show their avatar and nothing else. number int No 10 The number of references to show. order string No DESC The order of which the references should be sorted. number int No 10 The number of avatars to show. size int No 42 The avatar size in pixels. ctype string No - Option to show buyers that paid using a particular point type. Should not be used if you only have one point type installed or if users can only pay using one point type. use_email int No 0 By default avatars are loaded using the users ID (0) but you can select to show avatars based on their email instead (1). default string No - Default image to use. Requires an image URL. If not used, the WordPress default one is used. alt string No - Option to set the avatar images alt attribute. Example 2: Show 15 avatars instead of the default 10. Example 3: Change the avatar size to 100×100 pixel. This shortcode allows your users to exchange one particular point type for another based on an exchange rate that you set for the shortcode. You can use the shortcode multiple times to allow exchanges between multiple types but exchanges can only be done in one direction per shortcode. from string Yes - The point type to exchange from. to string Yes - The point type to exchange to. rate int or float Yes 1 The exchange rate between the two point types. min int or float Yes 1 The minimum amount of points that must be exchanged. button string No Exchange The form submit buttons label. 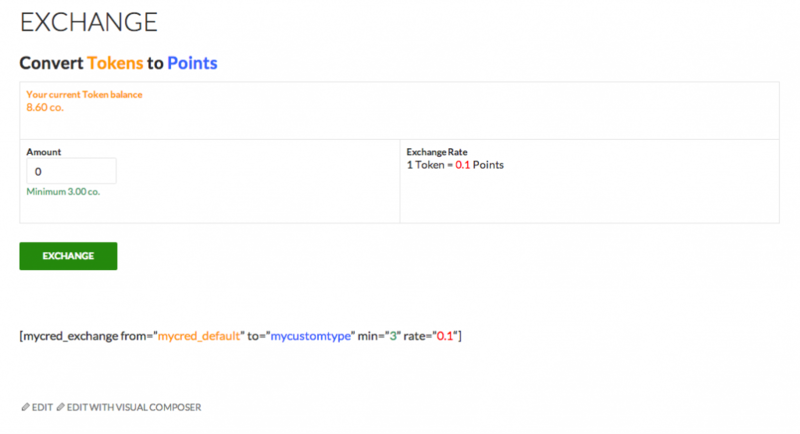 Example 1: Let users exchange the default point type to a custom point type at a rate of 1 for 1. This shortcode will generate a table where all enabled hooks for a particular point type is listed. You can use this to show how your users can earn points based on how you setup your hooks. type string No mycred_default Option to filter hooks by point type. Should not be used if you only have one point type installed. gains int No 1 Select to show either: ways a user can earn points (1) or ways a user can lose points (0). post string No -post- Text to show for post related template tags since they can not be rendered here. comment string No -comment- Text to show for comment related template tags since they can not be rendered here. amount string No - Text to show for amount related template tags since they can not be rendered here. nothing int No - Message to show when no active hooks were found for your setup. This shortcode allows you to list all published myCRED Lotteries. You can select to show all or a specific number of lotteries if you run more then one. number int No -1 Number of lotteries to show. Use -1 to show all published lotteries. status string No publish The status of the lotteries to show. show_title int No 1 Option to show the title for each lottery (1) or hide the title (0). nothing string No There are no active lotteries at this time The message to show users when no active lotteries exists. Example 1: Show last 2 lotteries. Example 1: Show only private lotteries without a title. This shortcode allows quick purchases of lottery entries with or without a custom price. You can for example use this shortcode for a “Quickpick” feature for “pick numbers” lotteries where the lottery will pick x numbers randomly for your user. Furthermore this shortcode allows you to set a custom price for entering the lottery. If the price is set for the shortcode then the user will be charged this amount each time they click on the button. Note that the shortcode is bound by the same rules as you setup for your lottery, so if you have selected to exclude certain users or limit entries, these rules will be enforced by this shortcode as well. draws int No 1 The number of draws to pick. cost int or float No 0 The cost of the quick draw. Use zero for free plays. label string No - Button label. loading string No "Working ..." Text to show while the quick pick is setup. confirm string No "Are you sure you want to get the quickdraw?" Confirmation message to show before the quick pick is setup. class string No btn btn-lg btn-primary button button-primary button-large Button classes. Example 1: Quickpick 5 sets of numbers for a “pick numbers“ lottery with the ID 1. No repeat. Example 2: Quickpick 1 entry for the next 10 draws for the lottery with the ID 2. Example 3: Quickpick 1 entry for the next 10 draws with the custom price of 5 points. This shortcode allows you to show all ranks a user currently has. Note that this is only usable when you have ranks for multiple point types. Example 1: Show current users Ranks but only show the logo and not the rank title. This custom shortcode allows you to show a progress bar for your users current rank. You can select the colors to use, if the progress bar should be animated and to show the minimum and maximum rank requirement for the users current rank under the progress bar. Requires the Ranks add-on to be enabled along with both the myCRED for Visual Composer and the Visual Composer add-on. Some theme’s with Visual Composer built-in, overrides or removes the progress bar shortcode. In these cases, this shortcode will not render an actual progress bar! title string No - Option to insert a title before the progress bar. bgcolor string No - Option to use one of the pre-set colors Visual Composer offers for progress bars. If you want to use a custom color however, please set this to the keyword "custom". custombgcolor string No - Option to set the background color. Note that if you want to set the bgcolor attribute to custom. decimals int No 2 Number of decimals to use in the progress bar. This shortcode shows a table with the remaining scratch cards in a set. Example 1: Show remaining cards in the set that has the ID 123.
user_id int No current Option to show the winning history of a particular user. Use current to show the current users (the user viewing the shortcode) history. type string No - The point type to show log entries for. Should only be used when scratch cards are set to payout a custom point type. show_nav int No 0 Option to show navigation for the log table (1) or not (0). inlinenav int No 0 Insert custom CSS to style navigation to be inline. Should only be used when the navigation is rendered vertically (0) instead of horizontal (1). Requires myCRED 1.7.5 or higher. Example 1: Show the current users winning history with max 10 log entries per page. Example 1: Show the last 5 wins the current user for a custom point type. This shortcode allows you to show parts of your content for those who fulfil the requirements you set. This shortcode is the opposite of the mycred_hide_if shortcode. You can set a balance requirement, rank requirement (if the Ranks add-on is enabled) or a reference count. user_id int or string No - Option to set the requirement for viewing the content to a particular user. Should not be used unless you must check a different users requirement then the one viewing the shortcode. 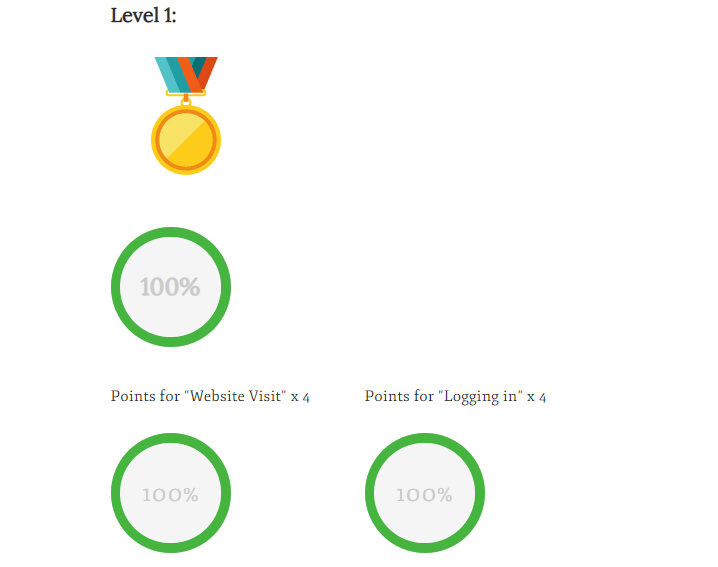 Example 1: To view the content, the current user must be: logged in and have 100 points or more. Example 2: To view the content, the current user must be: logged in and have 0.010 points or more. Example 3: To view the content, the current user must be: logged in and have the “Commander“ rank. Example 4: To view the content, the current user must be: logged in, have 1000 points or more and have the “Commander“ rank. Example 5: To view the content, the current user must be: logged in and have gained points for approved comments at least 10 times. Example 6: To view the content, the current user must be: logged in and must have either a) gained points for approved comments at least 10 times OR have the rank “Master“.